I think it’s fair to say that we all want good or at least better health and one component of achieving that is performing regular exercise. However, we live in a world that puts tremendous amounts of strain in our lives. There are thousands of different exercise techniques and philosophies, which makes it hard for a regular person to know what’s the right thing to do. Now we are going to talk about an exercise activity that is not only efficient but also effective and fun and literally works every single muscle cell and organ of your body. That exercise activity is the rebounding. Albert E. Carter is the pioneer of rebounding and I would suggest going to look at your local library, doing a search on Google, hitting up Kindle or Barnes & Noble for some his books which go into great detail about the philosophy, the physiology and the health benefits to the human body on rebounding. Now all rebounders are not created equal and you are easily going to find them in the thirty dollar range at your big box store and up to a thousand-plus dollars for a high-end model. 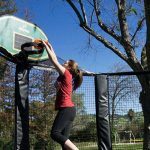 So what are some things you want to look for in a quality rebounder? Most quality rebounding mats are going to be made from a material called permatron and this is not something you are going to get from a low cost model. In addition you want a nice heavy frame which is made up of commercial-grade steel and that will help it to last a lot longer. You also want the legs of the rebounder to be strong. Some will fold; some will be straight down while others are bent. In some models, the legs will budge out a little bit and give a larger base of support so the unit does not feel like it’s going to tip as easily. In terms of rebounding, you also have shock absorption system, which is either going to be metal springs or bungee cords. You should try out the spring system and check to see if it is noisy or silent. A silent system has its own advantages. You can use it at anytime of the day and not interrupt anybody. You should also get a feel of the bounce – it should feel smooth and not jarring. Many of these rebounding units come with a balance bar, which not only helps for safety but also helps in performing a different variety of exercises. You also want to have an idea about what the warranty period of your rebounder is. Obviously the longer, the better. So, apart from all the health benefits of rebounding from stronger muscles, better bone health, improved cardiovascular function, lower blood pressure, lower cholesterol, improved respiratory rate and oxygen absorption, better digestion and elimination, improves balance, proper reception and coordination and in many cases most importantly improves immunity and assistance to the lymphatic system, there’s a lot of other practical reasons why people like the rebounder as well. 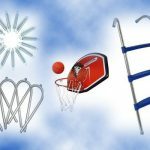 The first one is that a rebounder is something easily incorporated into any household. It is easily accessible and you can use it in some capacity every day. 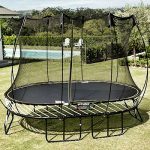 Also in terms of other home exercise equipment, I would say mini trampolines have a little range, mid-range and higher range that is comparable to stairmasters, ellipticals, treadmills and the like. Instead of focusing mainly on one body part, a rebounder gives you a lot more variety and again works every single muscle in multiple different directions all at once. One of the biggest things is that this is also the fun factor. It really does not feel like exercise, it feels more like play. It’s just a lot more enjoyable to do whether you are listening to music, watching TV or doing it in complete silence and trying to relax and getting away from typical day to day stresses. 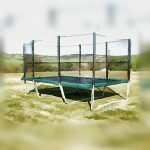 In terms of the bounce, the mini trampoline is relatively silent and you can do it at any time of the day or night. 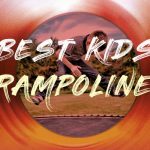 The rebounder is also great in keeping the whole family active whether it’s below zero outside or a 100 degrees, we can bounce on this any day of the year. We can also take it outside once the weather gets nice. The rebounding activity is very low impact and doesn’t hurt the joints in any way, shape or form. When you are finished with it, your muscles feel tingly and you feel energized. You will think better and it’s definitely a lot of fun. Probably one of the biggest things is that it’s something that can be used with any age group. 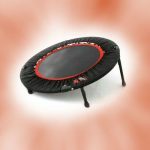 In terms of record levels of childhood obesity and adult obesity, a rebounder is a wonderful tool to keep people moving and exercising on a day-to-day basis. 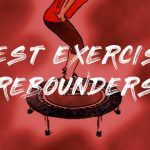 Therefore, if you’ve never rebounded, I highly suggest giving it a try as research study shows that even just 20 minutes of rebounding compares to one hour of running. Therefore, you will effectively save 40 minutes during your time-crunched days!